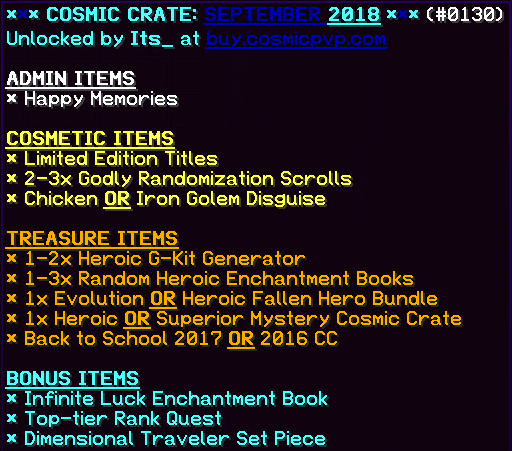 September /cc, Infinite Luck, Dragon Strongholds! Discussion in 'Server Announcements' started by ypperin, Aug 31, 2018. It's Friday! Time to throw off the shackles of the week and settle in for relaxing games, sleep, and pvp! The temperatures are starting to settle some, autumn is just around the corner, and nearly everyone is back to school! Time to hop back into that grind! Negates incoming Specialty Armor Set Bonuses depending on enchantment level. Featured in the September /cc the Heroic /gkit Generator will provide you with a random piece of /gkit gear on Heroic Armor! Simply right click the chest to open it! Note: Until reboots you may have to update your inventory to see the item. Simply open and close your inventory after opening the Generator! A more traditional take on Outposts, players on Dragon Planet will have the opportunity to compete for Faction Perks, Points, and OP Rewards by dominating and controlling one of the two Strongholds. Located at 5000x, 5000z and -5000x, -5000z Strongholds not only offer OP Loot, but some highly coveted Faction Perks worth fighting for! To cap a Stronghold you must mine through the wall, break the current cap, then cap it for your faction! Loot spawns within the chest in the [Sell Room]. Once controlled simply right click the [Sell Room] sign located within the stronghold as well on the exterior near the Stronghold Doors! Strongholds are physical locations within the overworld at 5000x,5000z and -5000x,-5000z. We're all hopping back into the grind! Autumn is nearly here and we're celebrating everyone heading Back to School! This weekend ONLY score a mind-blowing 50% OFF all packages at the Server Store! Noww thissd iss how ur kids are getting some new shoes!